Silas Tolburt Jordan ,born September 8, 1840 in Henderson County, State of Texas, was the son of Captain John Jordan and Eliza Jane Jordan. He spent his boyhood days with his parents at Jordan Saline, where they were in the business of manufacturing salt. He was ten years of age when his parents and Alney McGee made up a wagon train and journeyed to California. They came by the southern route in 1850. He helped all he could at his young age making a good hand along with his sister and brothers. Their first stop in California was at San Diego on the Pacific Ocean Coast where the train disbursed. Each family went their own way. Captain John Jordan stayed some time longer looking the country over for a place to settle before moving his family up the coast of California before settling down. He and his family found a likely place near San Juan Bautista Mission in the village of San Juan in Monterey County. At this place they built a hotel and a store. The women folks looked after and ran the store and hotel, while Captain John and his boys went out and ran cattle on the open range. This gave young Tolburt something entertaining to do. A few months of the year he was sent to school near the mission. Tolburt did make one cattle drive to the market over in the mining country up in the Mother Lode. which he enjoyed. In the year 1857, Captain John Jordan moved his family to Tulare County, ten miles east of Visalia just south of Kaweah River, on 80 acres of land which he purchased the year before young Tolburt was 17 years of age. He made a good hand in moving and in building their home here. This place stayed in the family name for 73 years. Tolburt stayed with his family helping his father at many jobs like digging a ditch form the Kaweah River to their farm to irrigate their garden and pasture. In the early spring and summer of the year of 1860, Captain John Jordan decided to try his skill at gold mining. The party consisted of Captain John Jordan, W. F. (Bill) Jordan, Tolburt Jordan and two other men. They traveled, by the way, over the Sierra Nevada Mountains, through the Walker Pass to the south. They finally stopped in the Panamint Mountain Range just west of Death Valley. They made camp by putting up a small cabin as their headquarters. They prospected out of this camp all summer without striking a claim. Around the later part of August their food supply was running low. Captain John Jordan and the other two men went for supplies, and left the two boys (Tolburt and Bill). to hold the camp down to do some more prospecting, which they did. One morning around three days after the men went after supplies, Tolburt and Bill just got ready to leave camp to prospect when a band of Indians came up, very much on the warpath. Tolburt and Bill grabbed their rifles and stood in the door of their cabin with guns drawn ready for battle. The Indians looking very mean, found no older men in camp and decided to leave the boys alone. On leaving, they thought that the boys were heap brave. When the Indians were out of sight and gone, Tolburt and Bill packed up a few things and left for home in a hurry. This was the last gold mining expedition that Captain John Jordan ever went on. Tolburt joined his father Captain John Jordan, his brother Bill Jordan, two other men, and two Indian guides on a trail building expedition. The expedition went across the Sierra Nevada Mountains to the east in early May of the year of 1861. Captain John Jordan and his son W. F. (Bill) Jordan formed a partnership in this trail building. They secured a franchise from the Tulare County Board of Supervisors to build a toll trail over the Sierra Nevada Mountains to Owens Valley to the east, a short cut to some newly struck gold and silver mines. Tolburt was 21 years of age. He was a very strong young man. He made an all around good hand at helping to build this trail. Tolburt spoke of seeing and catching golden trout. It was very amazing and interesting to see these golden fish high up in the mountains. In fact. this was the very first time that any white man had ever seen these fish. Before the summer was over, they made and finished two different trails to Owens Valley. They forked the trail about half way over the mountains. Tolburt enjoyed telling the experiences that he had helping with the trail building that summer. He spoke of the golden trout many times. The next spring early in May 1862. Captain John Jordan and son Bill decided to rerun the trail. Tolburt and one other man went with them. They made some improvements here and there. They set up their headquarters for the eastern end near Fort Independence in Owens Valley. They did some other business over there and then they started back home. At this early time in the year they had to use the lower trail across Olanche Pass over the mountains. It was too early to use the north trail over Cotton Wood Pass, as there was much snow and ice up there. When they arrived back at the Big Kern River crossing. they found the river running bank full and just a torrent. They could not cross, so Captain John Jordan said that they would stay and wait until the weather turned cooler and the river would go down and then they would cross. This never happened. Eliza Jane Jordan, the wife of Captain John Jordan, got worried when her husband and party had not come home when he said that he would, and in a day or so she sent a party with plenty of food to locate him. This party found Captain John Jordan and party on the east side of the Big Kern River just about starved, as at that time of year the game animals had not gotten up that high in the mountains. There was no game for food. The rescue party could not get to them so they went upstream to where a small bluff overhung the river and it was narrow at this point. They cooked the food and threw it across the river in a sling. They soon got Captain John Jordan and his Party fed and made strong in a day or so. Captain Jordan was anxious to get back as he was to make a report to the Tulare County Board of Supervisors that the toll trail would be ready for business on the 4th of June. He decided to make a raft of logs. They all got busy and in a day or so, they had a good log raft made with a long pole to Push the raft with. The morning of May 22, 1862, the party mounted the raft and shoved off into the swift water. They used the pole to shove off and kept shoving the raft across the river. They were making good headway across when the raft hit a large boulder busting the raft to pieces. Captain John Jordan called to the men to grab the pole and he grabbed for it but missed. He came up for the third time and that was the last time that they ever saw him. His body was never recovered. They spent some time searching for it to no avail. Tolburt helped his mother Eliza Jane to recover from the loss of her beloved husband and he helped hold the family and farm together for a year or so. He then went off to the mines in search of work. He was gone for four years. He came back home and helped his mother for awhile and then went up into the Yokohl Valley and worked for brother Bill helping him with his ranch building. On September 30, 1866. Silas Tolburt Jordan married Mary Elizabeth Brooks of Yokohl Valley in Visalia. After their marriage. they went up into the Yokohl Valley and took up a homestead just north of his brother Bill's ranch. They built themselves a nice cabin and out buildings. Tolburt bought a band of sheep from his brother Bill, and from this band of sheep, they made a fair living and good life. When they improved the homestead, they sold it to his brother Bill. During this stay on their homestead, two children were born, Mary and Silas. After the sale of his homestead. Tolburt moved his family to Shasta County, where he engaged in gold mining. He had a good gold mine in the vicinity of Redding, California, which he worked for many years. There at the mine three more children were born. They were Minnie, Eliza and Andrew. This part of the family was little known to the families in Tulare County. 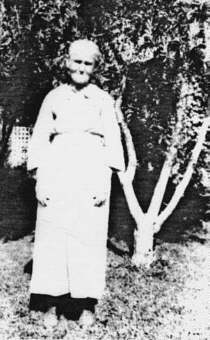 Mary made several trips to Tulare County to visit her sister. After the sale of his homestead, Tolburt moved his family to Shasta County, where he engaged in gold mining. He had a good gold mine in the vicinity of Redding. California, which he worked for many years. There at the mine three more children were born. They were Minnie, Eliza and Andrew. This part of the family was little known to the families in Tulare County. Mary made several trips to Tulare County to visit her sister. On one such trip she brought her older daughter Mary with her. Mary (Maid) met and married Edgar Lewis Coburn, who was a farmer and farming in the vicinity north east of Farmersville. That is where Mary lived the balance of her life raising a large family. Tolburt made one or two trips hack to Tulare County. The last trip he helped his brother Jim Jordan around 1904 to build a wagon bed for Jim's new wagon. Tolburt was a very good blacksmith. Soon after that Tolburt went south to old Mexico. He never returned.